— Submitting photo When the bite gets tough, go to light line and small baits. 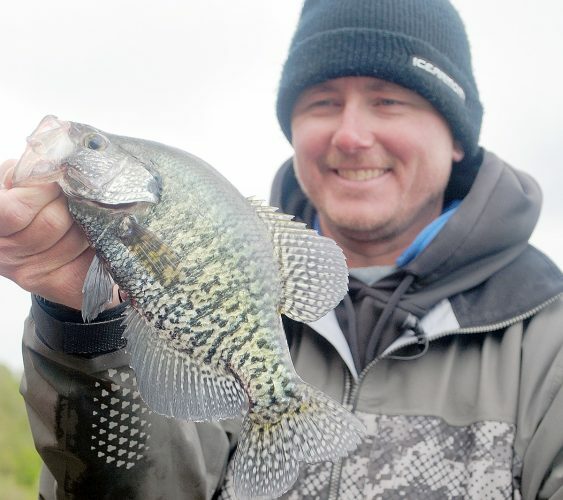 This South Dakota crappie wanted tiny baits with almost no action. I saw a skim of ice on the pond this morning. Certainly not enough to walk on, but enough to provide hope that ice-fishing is not far away. Some folks just enjoy the social aspect of sharing an ice shelter with a friend or family member, but we all want to catch a fish, or a bunch of fish. If you keep these ideas in mind when you’re on the ice, your chances for catching a fish, or a bunch of fish, will go up. When fishing is slow, get as many lines in the water as possible. Be very sure that you know the rules of where you’re fishing when it comes to the number of lines you can have in the water. Some states in the Midwest allow two lines, others permit more. Know how many you can have, then get that number down there. When you’re fishing from a shelter, hold a rod in your hand, and have another line with a slip-bobber on it. Work the rod in your hand more aggressively with a spoon or a jig, and let the slip-bobber rod with just a minnow or wiggler on it work more passively. Let the fish show you the presentation they want. Another thing. Keep the bait above the fish. Fish see up better than they see down, so if your bait is above them, they have a better chance of seeing it. It works well to “pound” the bottom with your bait a couple of times to get the fish’s attention, but when you see a fish on the sonar, get your bait a couple of feet above it. If it won’t come up for the bait, lower it just a bit. Many of the sonar units that are available today do an outstanding job of showing fish and even the tiniest lures. The Vexilar FLX-28 that I use does everything that an ice-angler needs to see what’s going on down there and will even help you figure out how the fish want the bait presented. Try new lures. Fish get conditioned to the same lure day after day. Be sure to give the new Forage Minnow Dart from Northland a try this year. It’s brand new, and it’s different. 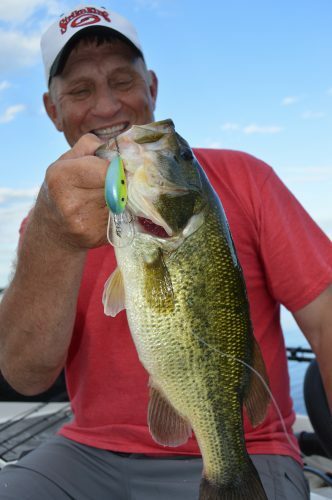 When fishing pressured fish, less action on your bait is usually better. Hard-to-see line is also usually better on finicky fish. Many anglers tie a short fluorocarbon leader to their main line because fluorocarbon is as close to invisible under the water as it gets. 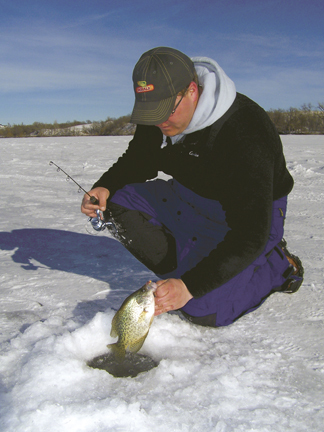 When it comes to fishing, there are no guarantees, but if you keep the above ideas in mind, you’ll improve your odds for getting bit through the ice.